One thing both Republicans and Democrats seem to agree on is that public policy is of critical importance to creating economic and demographic success in various geographies. Of course, they disagree on what the right policy is, but they both seem to believe implementing some set of policies is important. But is that really the case? Let’s take a look. Firstly, at the national level, we know that there is huge variability demographic and economic performance between states, regions, and cities. So while perhaps national policy can act as sort of general boon or a bane for localities, it can’t be deterministic. This is also true at the state level. Let’s examine one place that many suggest is doing everything right – Texas. Texas has really been the huge winner in terms of population and job growth in America in the last decade. But a look in more detail shows that this success is hardly uniform. Here’s a map of Texas counties for population change in the last decade. Change in population, 7/1/2000-7/1/2009. Source: Census Bureau Population Estimates Program. Positive growth in green, negative growth in red (Hey, it’s Christmas)As you can see, population growth in Texas has been largely a “Texas Triangle” phenomenon – i.e., the cities of Austin, Dallas-Ft. Worth, Houston, and San Antonio. Much of the rest of Texas – at quick glance 119 counties – actually lost population. Change in jobs, 2000-2009. Source: Quarterly Census of Employment and Wages. 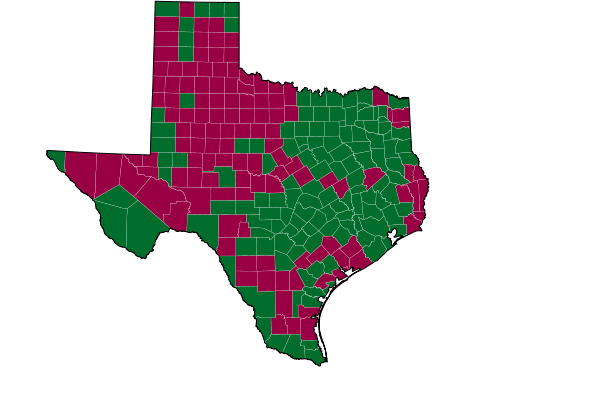 Positive growth in green, negative growth in red.Even here, we can see that many Texas counties actually lost jobs. All that supposedly wonderful Texas state policy didn’t do a lot for much of the state. My own personal view is that state policy needs to follow the dictum “First, do no harm.” I’m not convinced there’s a lot states can do to make localities prosperous. However, there’s a lot they can do to make things worse. So what about localities? Now it gets interesting. Let’s consider the Midwest/Rust Belt region. I wrote a piece last year called “The Successful, the Stable, and the Struggling” that categorized Midwest cities into those buckets based on population growth. Other than Chicago (a unique beast), this sorting seemed to foot well to conventional views of overall urban success, economic growth, etc. That would imply that policy didn’t matter, but size and being a state capital did. It doesn’t necessarily explain why Springfield and Lansing never made it, but one could easily argue that Chicago and Detroit became colossi that simply sucked up everything that otherwise would have gone to the state capital. Similarly for Harrisburg, and possibly Jefferson City and Frankfort. One might then proceed to ask why Madison and Columbus didn’t share this fate. Possibly it was the fact that Milwaukee wasn’t a mega-city or that in Ohio there were always many urban centers. But possibly it was also because they did have the state’s major university, which gave them the oomph to push them over the top where they otherwise wouldn’t have made it. (Lansing has a quality Big Ten school, but it is clearly second fiddle to U of M and Detroit is also a colossus). But there are other ways to look at this successful group that distinguishes them. Though exhibiting a favored quarter development pattern, they all have fairly balanced metro area growth in 360 degrees. Other, more struggling areas are unbalanced in their regional growth. Is this a key? This immediately leads to the observation that none of these places is on a major geographic barrier such as a lake or huge river that would have caused unbalanced development. Both the Twin Cities and KC were far enough upstream to make their rivers much less of an obstacle. Indeed, in places like Cincinnati and Louisville, river bridges remain huge topics of civic debate. Is it really a matter of geography, not being a state capital? Or perhaps another matter entirely. The state capitals were chosen to be geographically near the center of the state, whereas the major cities were on the fringes. Why was that? Originally, you needed to be on a major navigable waterway for growth and connectivity. Most of the original cities bloomed early because of this. Beyond that, these water transport routes enabled the development of vast complexes of heavy industry. Those major waterways were not near the center of states, but were instead state boundaries. Kansas City isn’t on this at all, but this is an almost complete overlap with my previous list. The only exception is Indianapolis, which I’ll return to in a moment. It looks like you can also predict success simply by looking at manufacturing concentration. If you were an old manufacturing city, you are going to struggle no matter what. If not, you’re much more successful. In other words, the good demographic and economic performance of these cities is a result of common outside factors, not policy. Conversely, despite a variety of state and local policies, all of the heavy manufacturing centers have struggled. Only Chicago has partially recovered, based on its global city core that is really a city within a city. Indianapolis was a manufacturing dependent city, but was never a truly huge industrial power, and otherwise met the criteria for success. 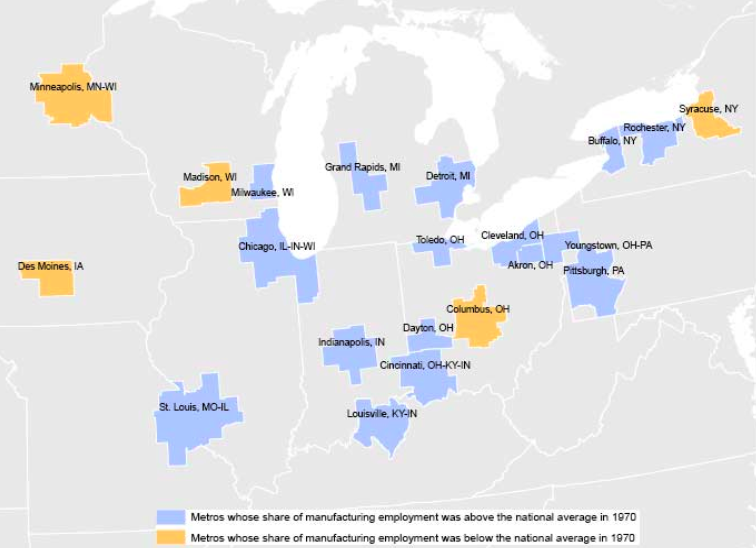 Jim Russell notes that on Testa’s map, Indy and St. Louis started off with similar manufacturing job share, but had highly divergent fortunes. He suggests a comparative case study of the two. The only place I might look for policy influencing outcomes is Indianapolis, one reason being that I can point to fairly unique policy turning points like Unigov, the 1970 city-county merger. I get incessantly accused of being an Indianapolis homer, so I guess that’s a risk here too. (I certainly don’t believe Indianapolis overall has superior public policy to other cities today – arguably the opposite). Looking at things like manufacturing concentration as a predictor of success is a variant of “single variable determinism.” That’s something that has always made me skeptical. As humans we have this overwhelming desire I think to reduce the world to simple cause and effect relationships, when the reality is a vast, complex, dynamic system. Nevertheless, this is interesting. There’s an entirely different version of single variable determinism at work in the worldview of Harvard’s Ed Glaeser. In an episode of Carol Coletta’s wonderful Smart City Radio syndicated program, Glaeser lays out the case for educational attainment being the overwhelming determinant factor in urban success in cold weather cities. The variable that predicts success among older, colder cities is overwhelming the percentage of the population with college degrees in 1960 or 1940 – places that had a longstanding connection to high human capital industries. I’ve made liberal use of this quote myself. Glaeser outlines a similar view of water creating industrial powerhouses. Perhaps the state capital angle is what boosted the educational fortunes of those cities. I don’t know. But this is an alternative view. Still, it doesn’t really posit success as being about any particular public policy. Yet another version of single or limited variable determinism appears in this week’s New York Times Magazine in an article titled, “A Physicist Solves the City.” This guy seems to be enamored of city size. For those of us who love to talk about policy – left or right – this is a bit humbling. It implies that all we want to do or not do is simply irrelevant. We shouldn’t shy away from that line of thinking. I’ve long said that one thing urban planning needs to have is a healthy dose of humility and awareness of our own limitations. Too often we fall prey to the belief that we can simply reshape our cities to be the way we would like them too be. The real world isn’t always like that. The failures of urban renewal and the unintended, unforeseen consequences of programs like urban freeways should remind us of that. The alternative, though, is fatalism. I don’t think we as human beings are programmed to simply do nothing and accept our fate. None of us, even I dare say our physicist friend above, behaves as if we really believe we live in a deterministic universe. If I’m going to go down, I want to go down swinging. While perhaps public policy of all varieties is of far less importance than we might believe, I believe we must continue to strive to improve our civic situations. We just need to do it with the proper perspective, taking due care not to fall prey to the lure of overreach and ultimately do more harm than good. Cincinnati’s position between the heavily manufacturing dependent metros and the greenfield cities in job growth suggests it is distinctive in some way. What could explain Cincy’s much greater job growth in comparison to St. Louis and Pittsburgh, two cities that Cincinnati is constantly compared to historically, economically, and culturally. It certainly can’t be its almost comically dysfunctional local politics. Maybe it is the location of a substantial part of the Cincinnati metro in Kentucky and that state’s lower taxes and more limited governmental regulation. I’d like to see real policies to improve quality of life for non-motorists in our cities. Empty gestures like supporting “complete streets” while devoting the vast majority of transportation funding to accommodate speeding motorists won’t result in us being the best or even among the top 10 cities for pedestrians and cyclists. It’s frustrating that cities like Columbus only put up a facade as adopting pro-pedestrian and cyclist policies. I’ve done more traffic calming on my bike than the city government would ever dare. This is one instance where citizens can supersede sub-par policy with some good old-fashioned DIY efforts, *if* they really want to. The vast majority don’t. Then you have cases where you’re at the mercy of city policy. Take the city’s bureaucracy that acts as a large brick wall for would-be small businesses in our urban core. Numerous businesses were/are stalled from opening for several reasons, some being pure BS. When small businesses are the only hope for blighted or up-and-coming neighborhoods the city does itself no favor by preemptively stamping out possible new businesses that are desirable and would have attracted visitors and residents further down the line, but instead were scared off by an unwelcoming city department. Just look at all of the repopulated homes and businesses currently investing in the former, barren wasteland that was the Short North which contributes plenty of money to the city that it otherwise wouldn’t be getting. Instead of learning from this and reaching out to currently blighted neighborhoods for similar success, the city continues to lose money from its many half-empty neighborhoods and insists that residents keep clearing ridiculously high hurdles that only a select few areas have managed. The city has no problem green lighting tons of rundown carryouts, cell phone stores, used car lots and check cashing joints to dominate a street scape and in many cases contribute more blight, but if you want to open a decent restaurant they’ll make you pay dearly for trying to improve a neighborhood, as was experienced by the entrepreneurs of this newer business Downtown. I think this partially explains why we haven’t seen a larger number of good small businesses willing to take a risk in neighborhoods where most entrepreneurs wouldn’t consider locating anyway. Downtown is already a hard enough sell with its lack of “free” and plentiful parking, let alone with having many national retailers pulling out of City Center Mall not too long ago. You have a downtown that desperately needs small businesses to fill in the numerous empty storefronts, yet you just scare a bunch of them away? I wish there was a way to measure the number of businesses who were going to open a business in urban Columbus, but instead decided against it because of unfavorable policies to do so and ended up elsewhere, likely in the suburbs. Columbus’ failure in these two departments alone have held it back from becoming a great city. The sad thing is, this is what residents can expect in the future from the city government since it isn’t addressing these matters and is more than happy with the status quo. While other cities like Minneapolis have surrounded their downtowns with repopulated, revitalized neighborhoods (their population grew by about 20,000 from 1990-2010) others like Columbus and Indianapolis are happy with citing 700,000+ population figures while ignoring the fact that our downtowns are surrounded on all sides by emptied, blighted neighborhoods that are a real burden. Numerous would-be good-to-great neighborhoods that attract visitors and residents simply don’t exist as a result. If Indy were to change policies where Columbus has failed (well, they’ve been successful for the sprawling outer city and the suburbs), it could be a truly great city instead of having the same few quality urban neighborhoods strewn about in a sea of blight. Imagine people actually wanting to head to places like E 10th St; I really think having the right policies is part of the equation that can make that happen. There are several mediators between manufacturing and later stagnation. Some of them are your greenfield factors. Manufacturing is labor intensive. Manufacturing cities were larger with larger local public sectors. Those public sectors now put a pension and red tape burden on the present city. The manufacturing cities also recieved their last large wave of in-migration after industrial employment started declining. The people arriving after the 50’s didn’t make it into the middle class, and their descendents are now stuck in an underclass. The influence of this underclass is what separates Buffalo and Detroit from Columbus and Minneapolis. People are afraid to invest in the region because any location-tied asset could be lost. The neighborhood around your development becomes dangerous – big loss. Your firm’s local income tax is hiked because the poor can’t support their city services – big loss. You grow your business to the point that you need to tap national talent market, but good candidates won’t apply due to your city’s national reputation as blighted – big loss. In places like Des Moines and Madison, these risks don’t exist. I took this entry as almost wondering about the worth of blogs like the Urbanophile for making a city successful -as opposed to Urbanophile focusing on more small scale Quality of Life policy suggestions. I think you are too hard on the power of policy which I think is considerable. Policy or economics really has not solved the problem of how to create dynamic new growth. That is tough on the Urbanoplile blog since this is one of central mysteries that this blog is trying to solve. However, I think the blog has identified and talked about the many things/policies that might be the key including things that can get in the way. Policy cannot turn straw into gold, but it can make or break a city with resources. Think of the many policy choices that Chicago and Detroit (plus the auto industry) have made since the 60s. It is easy to create a plausible counter-factual where Chicago does much worse and Detroit does much better. The rebound of NYC was perhaps inevitable giving that it a world financial center, but it did not have to be well managed. Are you saying that policy has little to do with NYC outperforming its mid 80s expectation (“the movie Escape from New York”) and LA underperforming its 80s expectations (the much more recent movie “Escape from LA”)? I think more was involved than just Wall Street and the end of the cold war being tough on SoCal aerospace. You did not talk about Portland in this entry, although I understand the “white city thesis” would help to explain the buzz of places like Austin and Portland (A city whose buzz and marketing image is perhaps too successful, given the size of the local economy, at attracting outside talent.) I can see a couple of the cities that you follow eventually becoming “hot” and generating national buzz. Why good policy and marketing cannot light the spark or predict when lightning will strike, it could certainly create the tinder. The above blog entry argues against the success of several metropolitan areas becoming the next big thing, although one never knows, the success of the sleepy Seattle area – Microsoft, Amazon, Starbucks, the music scene, etc. was all fairly unexpected when Seattle’s streak started in the 80s. Right now the performers are stable, non-market white collar jobs: Eds, Meds, and state government. Along with the global city of Chicago they make up the most comfortable section of the Midwest economy. Based on the changes we have seen, there is no reason to count on the fact that this will be true 20 years from now. So while the analysis in this entry is strong, I do not think that if one had the ability to wave a magic wand and thus move in a medical center, make the Indy campus the state flagship and create a giant heat-lamp over the city for that warm weather you would have ensured the prosperity of Indianapolis for the next 20 years. The future of the city rest with good policy and (hopefully good) unforeseen events and trends. This is a minor thing, but please use a color-coded legend in your maps. It took me several moments to realize the legend was actually in the caption. Good read Aaron, as usual. To look very simply – seems like the age old nature vs. nurture question. Most argue that the nature is a key determining factor but that there is still stuff you can do to improve your (or a city/region’s) lot in life. I have made the comment in the past that perhaps in some ways, the measure of how well a city has done is based on ITS size, not the number of jobs it attracts. If you look at Columbus vs. Cleveland, for example, I bet the Cleveland has actually produced as many or more new economy jobs than Columbus has since 1970. The problem is that Cleveland already had a much larger population and jobs base. I would be interested to see what the raw numbers are of each. Of course raw numbers are not the only story. If you don’t produce enough jobs to keep your population employed, you will fade, no matter how large or small. But looking at the raw numbers could be insightful. Maybe Cleveland has done a good job of creating new economy jobs, but it has just been overwhelmed by the loss of manufacturing jobs. Columbus, a metro of less than half the size of Cleveland in 1970, could have grown new economy jobs at a much lower total, but because it’s so much smaller, it can look like a darling. Where you start from can greatly impact the view people have of where you are going. So how do you write a post about the irrelevance of policy and then don’t even talk about policy? There was discussion of geography and manufacturing-based city economies vs. state capitals but where was the discussion of tax policy, education, urban planning, economic policy and social programs? I really don’t get the point you were trying to make with Texas. Is it surprising that all of the growth is concentrated in the major metropolitan areas? And what policy does Texas have that would posit it’s success? No personal income taxes? What? No one policy guarantees success, but there isn’t one successful city that doesn’t have policy that didn’t contribute to its success. re comment #1 by Matthew Hall: Cincinnati is “distinctive” because it has two key economic drivers (in addition to the eds-and-meds in any big city). One is the headquarters and significant product-development and marketing-management operations of the largest consumer-products marketing company in the US. As the consumer economy has grown, so has P&G by both internally-developed products and acquisition. The other is the jet-engine operations of GE, which have thrived with the air-powered defense spending starting with the Reagan era. Kentucky tax policy has nothing to do with either. Growth of both big private-sector operations have been driven by acquisition and centralization by P&G, and by federal spending unrelated to municipalities (GE). This is a contrast with Indianapolis, which had two clear policy directions that aided its shift from manufacturing to diversified economy: unified city-county government (which brought many greenfield development sites of the last 40 years into the urban boundary) and the downtown sports focus (which later broadened to add convention tourism to the mix). Chris Barnett, Your view that Cincinnati’s relatively good job growth is due to just two businesses is very thought provoking. While most Cincinnatians are certainly aware of these companies, I don’t think most understand that they are the main source of the metro’s economic growth. Such a realization might have interesting and counter-intuitive implications for local politics and economic development efforts such as more support for regional economic development efforts if not outright unified regional government. Matt, I am not asserting that job growth in Cincinnati is only about P&G or GE. I picked only the two obvious major employers (economic drivers) whose growth and longevity have nothing to do with ongoing state or local policy, to illustrate that state and local policy have limitations and that some job growth is a happy accident of location and/or exogenous conditions. The point: P&G hasn’t grown by acquiring other companies because of anything Cincinnati, Hamilton County, or Ohio did. P&G bulked itself up to survive in a global marketplace and maintain earnings growth. Cincinnati reaps benefits (well-paying jobs and money spent locally by those employees) from their corporate strategy. With GE, it’s more about inertia and investment in place. After a point, they simply couldn’t duplicate the Evendale infrastructure for jet engine design and manufacturing. Chris, Do you think P&G is more influential overall in Cincinnati than Lilly is in Indianapolis, for example? It just seems that there must be more than dumb luck to explain local economic growth measures. Matt, that’s an interesting question. To the extent that the Lilly Family fortune went into the Lilly Endowment and continues to produce dividends for Indianapolis, I’d say the name “Lilly” means far more here, and more broadly in the community, than either “Procter” or “Gamble” does in Cincinnati. Just last week the Endowment gave Ivy Tech State College $23 million to buy and rehab a building adjacent to the campus. The impact of either company name is probably about equal, but P&G dwarfs Lilly nowadays, almost 4 times the sales…20-25 years ago they were far closer in size. Then Indy has Wellpoint, a fast-growing health-insurance company that was definitely not “Fortune 500” 25 years ago. Another “dumb luck” thing for the city: our stodgy old Indiana “Blues” began taking over other Blue Cross and Blue Shield operations, morphing into “Anthem” and then taking over Wellpoint and adopting its name. But no local or state government policy led to that internal decision to grow. (Maybe in a backward way: the Blue Cross management saw what happened to Indiana’s banks. Virtually all gobbled up by Ohio banks in the 80’s and 90’s; you’d recognize the names, such as Bank One, 5/3, Huntington, Key, Nat City. Anthem decided to be the Bank One of healthcare, taking a dominant position by nationwide acquisition.) Today, Wellpoint is either #1 or #2 in health insurance, depending on whether you count premium dollars or number of insured. Oh, sure, Indy assembled and cleared land for an admin complex for Anthem downtown about 10-15 years ago, and for a Lilly expansion too. But that was a reward for their growth, not a prerequisite for it. The best entrepreneurial policy for state and local governments might just be fostering Jim Russell’s type of “robust expat/alumni network”. I might be tempted to cite your interpretation of your Texas as an example of the almost universal fallacy of reading geographic area as substance. Everybody does it around census and election time but it’s still aggravating. When you say that “most of the state” lost population, that may be true in terms of area, but the losing counties are mostly rural and the growing counties are mostly urban, so the vast majority of the people of Texas are in growing counties! From a quick glance at your map it looks like ALL of the major Texas metros gained population, all the way down to the scale of Corpus Christi and McAllen/Brownsville. Yes, an impressive amount of empty space became emptier, but on an urbanophile blog, why should we care about that? As always with maps, we have to keep asking ourselves: ‘Do I really care about land area?’ Because that’s what maps emphasize. End of rant. Great post otherwise!